A coordinated regulation of different branches of the flavonoid pathway was highlighted that may contribute to elucidate the role of this important class of compounds during the early stages of apple fruit development. Apple (Malus × domestica Borkh.) is an economically important fruit appreciated for its organoleptic characteristics and its benefits for human health. The first stages after fruit set represent a very important and still poorly characterized developmental process. To enable the profiling of genes involved in apple early fruit development, we combined the suppression subtractive hybridization (SSH) protocol to next-generation sequencing. We identified and characterized genes induced and repressed during fruit development in the apple cultivar ‘Golden Delicious’. Our results showed an opposite regulation of genes coding for enzymes belonging to flavonoid and monolignol pathways, with a strong induction of the former and a simultaneous repression of the latter. 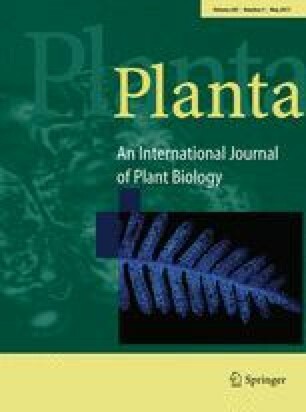 Two isoforms of phenylalanine ammonia-lyase and 4-coumarate:CoA ligase, key enzymes located at the branching point between flavonoid and monolignol pathways, showed opposite expression patterns during the period in analysis, suggesting a possible regulation mechanism. A targeted metabolomic analysis supported the SSH results and revealed an accumulation of the monomers catechin and epicatechin as well as several forms of procyanidin oligomers in apple fruitlets starting early after anthesis, together with a decreased production of other classes of flavonoids such as some flavonols and the dihydrochalcone phlorizin. Moreover, gene expression and metabolites accumulation of ‘Golden Delicious’ were compared to a wild apple genotype of Manchurian crabapple (Malus mandshurica (Maxim.) Kom.). Significant differences in both gene expression and metabolites accumulation were found between the two genotypes. The online version of this article (doi: 10.1007/s00425-017-2660-5) contains supplementary material, which is available to authorized users. We are grateful to Pierluigi Magnago for the maintenance of the orchard. This work was supported by the Autonomous Province of Trento “TranscrApple” grandi progetti 2012 to ASA.